Trump’s executive order halts visas for 90 days for “immigrants and non-immigrants” from Syria, Somalia, Sudan, Libya, Yemen, Iran, and Iraq. In response to the lawsuit, U.S. District Judge Ann Donnelly issued an emergency order that temporarily blocks U.S. authorities from deporting those from the nations listed in Trump’s executive order. While the government can revamp its flawed screening process, it may be instructive to recall that President Clinton and his fellow Democrats had some similar ideas to the ones they are protesting now! 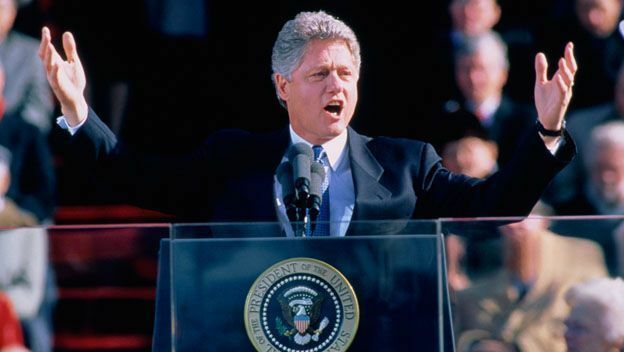 Democrats have likely forgotten that they cheered and gave President Bill Clinton a STANDING OVATION for his idea to build a wall and deport criminal illegals. Critics are going to claim that Trump is just using minorities as an excuse to be a jerk, but is it so far-fetched to believe that he is actually a President who cares about everyone in America! Oh! I see. It’s ok when it was their idea , but despicable when Trump tries to enforce the same thing. Why can’t we ever come together when we know it will be beneficial to the American people? Time for TERM LIMITS!!!
? President Bill Clinton talked about it ? didn’t happen ? no balls to do it ?
? President Donald Trump talked about it ? and followed thru with it ? he has balls ? Clinton doesn’t mention a wall in this video. Why do you lie? Stupid Democrats can’t even tell when they are being hypocritical.